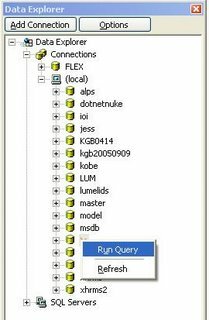 As mentioned in my previous blog, I have choosen VFP9 Data Explorer as data querying tool during testing. 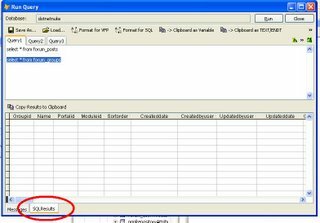 There are some features found in query analyzer but not in VFP data explorer. 1. Execute highlighted script instead of all of them. 2. Multi pages script editor. The more I use data explorer, the more I miss these features. Therefore, I decided to write a prototype as "addin" to enhance data explorer. Download the addin from here. To add this "addin" to data explorer is easy. 1. Extract data explorer project from xsource. 3. Drag and drop dataexplorerplugin class from czui.vcx to runquery form. 4. Recompile dataexplorer project to .app. Next, it is time to try it out. 1. As usual, run the newly compiled dataexplorer.app from VFP IDE. 2. Drill down to desired connection. List of databases will be shown. 3. 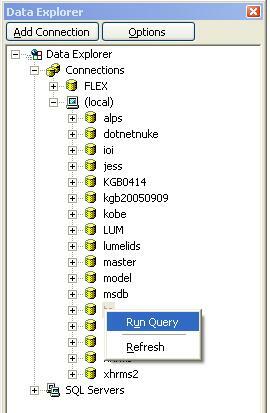 Select database, right click and select "Run Query" shortcut menu. 4. Query form will be shown as Figure 2. 6. To remove particular page, select desired page and click close page button. 7. To execute only part of script, highlight the script and press F5. 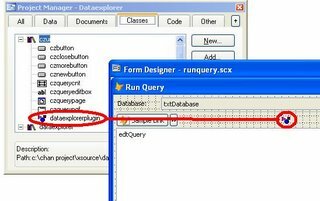 You may notice that data explorer only have ONE result returned. This also applicable to existing query addin. For example, if you highlight a line of script and run "clipboard as variable" addin, only highlighted script will be copied to clipboard as variable. As mentioned it is just a prototype. There are a lot of enhancements required. 1. Refactor the code to be move extendable. 2. Each query page has its own result panel. The other thing have to be considered is how to add new feature as above using addin approach;without need to recompile data explorer. If user click new button followed by restore in some of my forms that contains more than ONE textbox_output controls, VFP will fall into "infinite loop". There are many actions run while new and restore button clicked. Generally, it has common actions such as enable/disable controls during new/restore state. During debugging, I found that when restore button clicked, all texboxes are disabled. Current active control.lostfocus will be fired. VFP will then try to setfocus to other controls. If the target control is textbox_output (e.g. txtEmployee_Name), VFP will not able to do that since textbox_output.When() always return False. 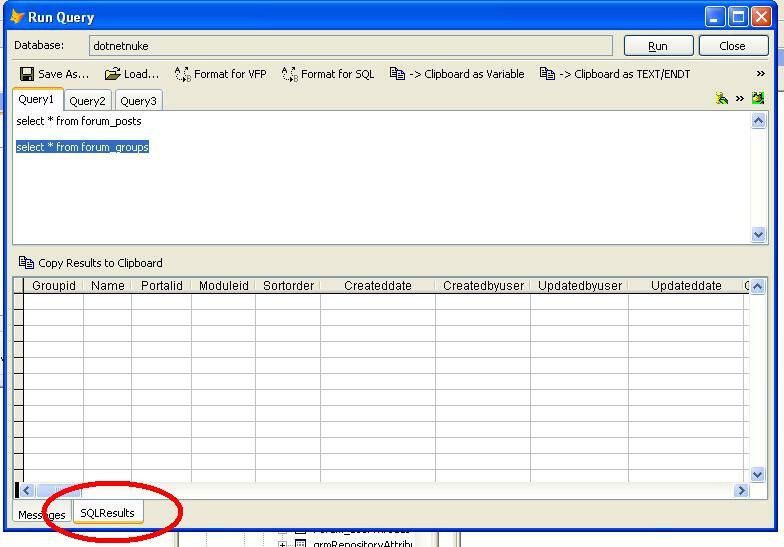 Therefore, VFP would setfocus to next textbox_output control (if any). Of course VFP will fail to do that so. This action keeps happen to the rest of textbox_output controls and back to the txtEmployee_Name again and so on. VFP then falled into hang state. I debugged other forms that also contains more than one textbox_output controls also but never face this strange behavour. I found that they are fine because the control VFP tried to setfocus is not textbox_output. My current workaround is set all textbox_output.enabled = .F. However I feel curious on how VFP decide which control to setfocus? It doesn't follow tabindex nor record sequence in .scx. Anyone can give me some ideas? One more video posted, I was thinking it talks about how project manager would resolve their issues if they choose the wrong tool for their project.